Rain and wind put air travelers behind on Thursday and likely will do the same for those driving the Friday morning commute. 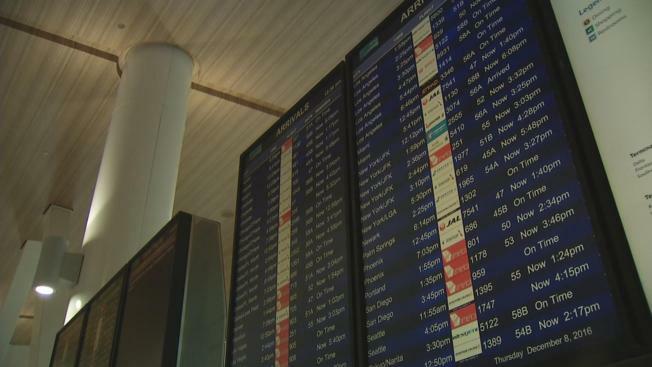 San Francisco International Airport saw significant delays Thursday due to reduced visibility caused by the morning downpour and then afternoon high winds, airport officials said. "We have weather here at SFO," airport spokesman Doug Yakel said Thursday. "We're seeing flight delays averaging about 60 to 90 minutes." SFO is one of the biggest casualities from the slew of showers that hit the Bay Area starting late Wednesday night. The airport and surrounding Peninsula areas received a little more than an inch of rain from the latest storm. After heavy rains let up around midday, wind took over and caused a ground stop, parking planes at the terminal and causing a travel headache for passengers with almost every flight delayed. But they got off the ground eventually. "Not a lot of folks are stranded," Yakel said. "That's because the airlines have better backup systems in place." Yakel estimated the residual flight delays would continue into Thursday night until about 11 p.m. Intermittent showers also were expected to continue through the night and into Friday morning, according to forecasters. Friday morning commuters could see off and on periods of lighter rain, not quite the levels seen Thursday morning. The next batch of heavier rain should arrive later Friday night and into Saturday, NBC Bay Area Meteorologist Rob Mayeda said.